urn your PC into a design studio and plan, design and decorate the exterior and interior of your dream house with Ashampoo Home Designer Pro 2. Quickly get through the formalities including contractor, planner location and basic settings such as number of floors and roof shape with the project wizard that comes with Ashampoo Home Designer Pro 2. 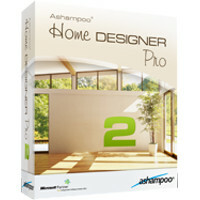 Angles, lengths, areas or volumes - focus on building while Ashampoo Home Designer Pro 2 does the math. Don't just settle for empty rooms! Ashampoo Home Designer Pro 2 comes with a comprehensive object catalog that includes doors, windows, electrical appliances and more.